In December 2016, we searched for all NM residencies listed on the American Medical Association Fellowship and Residency Electronic Interactive Database (FREIDA) (https://freida.ama-assn.org) as well as the five NM residency programs in Canada (https://phx.e-carms.ca/phoenix-web/pd/main?mitid=1367). For the programs that did not have a direct website link in the FREIDA database, we performed extensive searches through each institution's home page. To evaluate the comprehensiveness of each website, we followed previously established methodology which included extensive searching for the presence of 44 criteria [Table 1]; these criteria were previously identified as important considerations for medical students applying for residency programs;,,,,,, any information that was addressed in any capacity within the website was categorized as present. 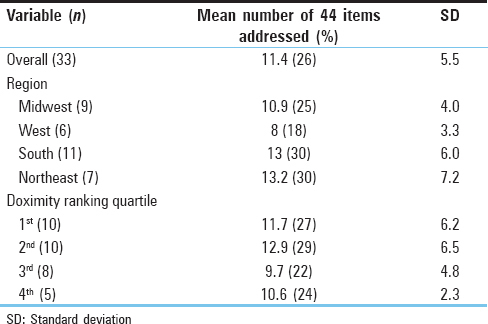 When comparing programs by their geographic region within the USA, there were no significant differences in the mean number of items available on each website [P = 0.23; [Table 2]. Similarly, when comparing the mean number of items between quartiles of doximity ratings, there was no statistically significant difference [P = 0.65; [Table 2]. Deloney LA, Perrot LJ, Lensing SY, Jambhekar K. Radiology resident recruitment: A study of the impact of web-based information and interview day activities. Acad Radiol 2014;21:931-7. Embi PJ, Desai S, Cooney TG. 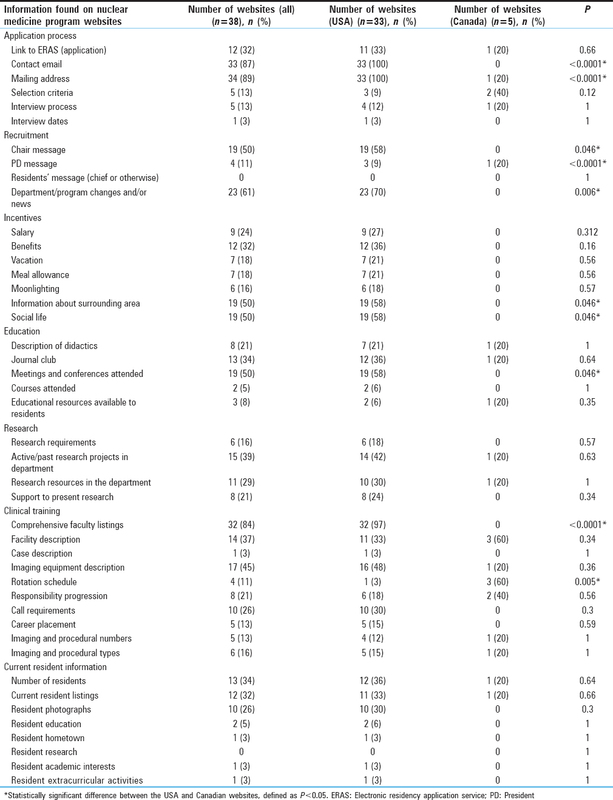 Use and utility of web-based residency program information: A survey of residency applicants. J Med Internet Res 2003;5:e22. Svider PF, Gupta A, Johnson AP, Zuliani G, Shkoukani MA, Eloy JA, et al. Evaluation of otolaryngology residency program websites. JAMA Otolaryngol Head Neck Surg 2014;140:956-60. Skovrlj B, Silvestre J, Ibeh C, Abbatematteo JM, Mocco J. Neurosurgery residency websites: A Critical evaluation. World Neurosurg 2015;84:727-33. Oladeji LO, Yu JC, Oladeji AK, Ponce BA. How useful are orthopedic surgery residency web pages? J Surg Educ 2015;72:1185-9. Ashack KA, Burton KA, Soh JM, Lanoue J, Boyd AH, Milford EE, et al. Evaluating dermatology residency program websites. Dermatol Online J 2016;22. pii: 13030/qt7rx3j2dn. Foster AM, Jackson CB, Martin SB. Reproductive health and cyber (mis) representations: A content analysis of obstetrics and gynecology residency program websites. Contraception 2008;78:99-105. Segall G, Thomson L. Moving forward after the ABNM/ABR Task Force. Updates from the American Board of Nuclear Medicine. Presentations at the Mid-Winter Meeting of the SNMMI. Orlando, Florida; 29 January, 2016. Baldwin JA, Harolds JA. Presentations at the Meeting of the Nuclear Medicine Program Directors at the Mid-Winter Meeting of the SNMMI. Orlando, Florida; 30 January, 2016. ACGME. Number of Accredited Programs Academic Year 2015–2016. United States. Available from: https://www.apps.acgme.org/ads/Public/Reports/ReportRun?ReportId=3&CurrentYear=2015& AcademicYearId=2015. [Last accessed on 2016 Jun 20]. Ng KL, Yazer J, Abdolell M, Brown P. National survey to identify subspecialties at risk for physician shortages in Canadian academic radiology departments. Can Assoc Radiol J 2010;61:252-7. Reilly EF, Leibrandt TJ, Zonno AJ, Simpson MC, Morris JB. General surgery residency program websites: Usefulness and usability for resident applicants. Curr Surg 2004;61:236-40. Rozental TD, Lonner JH, Parekh SG. The internet as a communication tool for academic orthopaedic surgery departments in the United States. J Bone Joint Surg Am 2001;83-A: 987-91. Phitayakorn R, Macklin EA, Goldsmith J, Weinstein DF. Applicants' self-reported priorities in selecting a residency program. J Grad Med Educ 2015;7:21-6. Pretorius ES, Hrung J. Factors that affect national resident matching program rankings of medical students applying for radiology residency. Acad Radiol 2002;9:75-81.